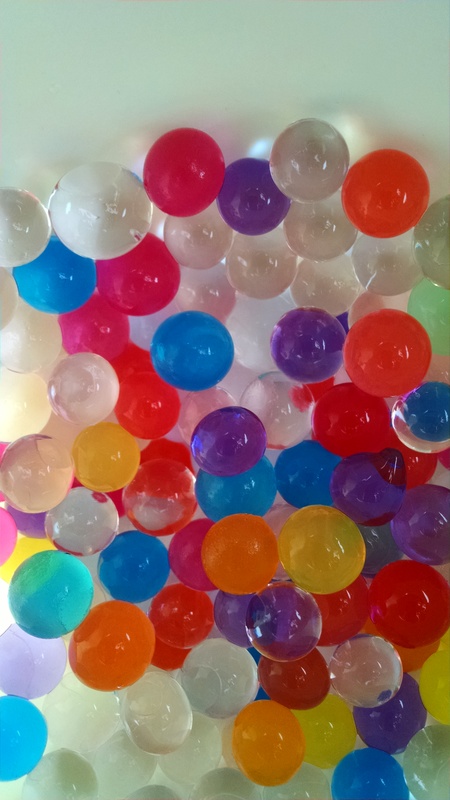 Water beads are FABULOUS to play with (see my last post) but bad to ingest (non-toxic, but not healthy…. again, see last post). So, if you’ve got a little one who ALWAYS puts everything in their mouth and swallows it, they’re not a good option. 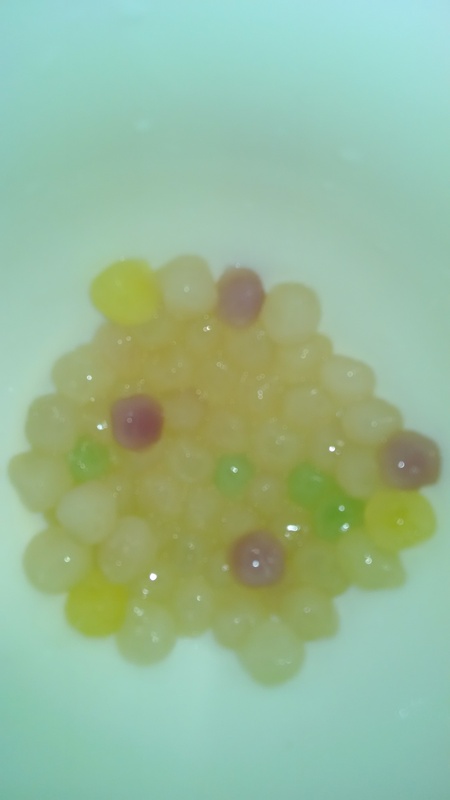 I’d seen a recommendation to use boba – tapioca pearls like are used in bubble tea. I decided to do a side-by-side comparison. My water beads were BioGel from Creation Station. The boba was Rainbow Tapioca Pearls, ordered from Amazon. On a pound-for-pound basis, the boba was half the cost, but really way more than I would need for sensory play for one kid. Boba – boil water, add boba, cook for five minutes or more, drain. Water beads – put them in water. Let them sit for six hours. Water beads win, but both pretty easy. As you can see, water beads are MUCH prettier than the boba. The boba was fine on its own – interesting shape, some shine, nice color. But doesn’t begin to compare to the beauty of the water beads! Boba – they’re pretty sticky – stick to your hands and stick to each other – so easier to play with if you float some in water. Interesting to touch, fun to “chase” around the water and catch, fun to squish between your fingers into blobs of goop. Held my son’s attention for about 5 minutes – if he’d used these before the water beads, they might have been more interesting. Water beads – VERY fun to play with – on their own or in water. Can be scooped, poured, picked up with tongs, and so on. (See my other post, or ideas on Pinterest.) Kept my son’s attention for a week of on-going play and exploration. Again, the water beads are the clear winner. Water beads – tasteless and no smell, so no motivation to eat, luckily. Note: my son did not taste them, because I told him they were not edible. I did taste them (licked one), for the purposes of this review – I wanted to know if they would appeal to toddlers. FWIW: My dog also was unimpressed. We dropped one on the floor, he picked it up, carried it in his mouth for a few seconds and spit it out. This is a dog who eats lots of stuff he shouldn’t (like socks), so these must really be unappealing. Boba – need to wash your hands and whatever surface you played on after use – starchy, gooey. Water beads – no clean-up needed. I dry my hands after playing with them. But my son (who is a kid who HATES being wet after water play) doesn’t even bother to dry his damp hands when he’s done. Boba – we didn’t have them around for long – they just weren’t interesting enough to keep around. I imagine they dry out and stick together, may go bad? Water beads – they’ve been sitting uncovered on the counter for a week, no maintenance needed. I rinsed them after a week, just for kicks. Don’t know if they were dirty. Water beads are a far superior sensory material. For me, personally, with my child I will use them in the future, and not boba. If you’ve got a kid who mouths and eats everything, then the boba may be a better option for you. This entry was posted in Play and Fun Activities and tagged kid, preschool, sensory, toddler, water beads on September 20, 2014 by Janelle Durham.